BRANDON, Man. – Kevin Koe will go for his fourth Tim Hortons Brier, presented by AGI, championship Sunday after a surprisingly easy 9-4 win over Brad Jacobs and Team Northern Ontario in Saturday’s Page playoff 1-2 game. BRANDON, Man. – Advantage Kevin Koe and Brad Gushue. The two most recent winners of the Tom Hortons Brier, presented by AGI, scored victories Friday evening at Westoba Place to secure hammer for their teams in Saturday’s Page playoff games. BRANDON, Man. 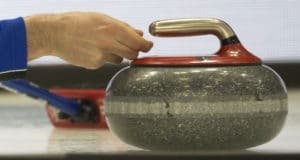 – The playoff matchups are set and all that’s let to determine in Friday night’s final draw of the Championship Pool at the Tim Hortons Brier, presented by AGI, is which teams will have hammer for Saturday’s playoff games. BRANDON, Man. 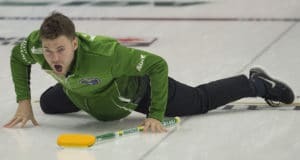 – Thursday afternoon Brad Jacobs said he wouldn’t mind a little adversity at the Tim Hortons Brier, presented by AGI, for his red-hot Team Northern Ontario that was cruising along with an 8-0 record. BRANDON, Man. 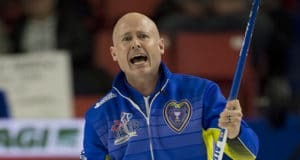 – Kevin Koe and Team Alberta, along with Brad Jacobs and Team Northern Ontario remained unbeaten Thursday as the 2019 Tim Hortons Brier, presented by AGI, moved into the Championship Pool at Westoba Place. BRANDON, Man. 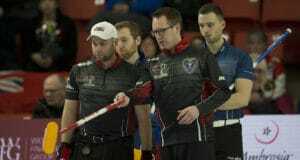 – It took until the final stone of the last game on Wednesday before Scott McDonald and Team Ontario earned a spot in the Championship Pool at the Tim Hortons Brier, presented by AGI. BRANDON, Man. – They’re wounded and without the record they would like, but Mike McEwen and Team Manitoba are advancing into the Championship Pool at the Tim Hortons Brier, presented by AGI. BRANDON, Man. 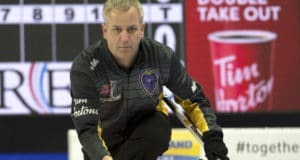 – Terry Odishaw made an 11th-end hit and stick for a 9-8 win over Team Ontario to give Team New Brunswick just its second win in the Tim Hortons Brier, presented by AGI, but it was enough to keep alive its hopes of advancing into the Championship Pool. BRANDON, Man. 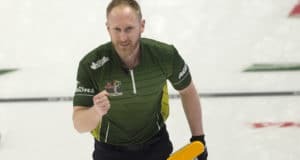 – It’s been six years since Brad Jacobs and his Northern Ontario teammates last won the Tim Hortons Brier, presented by AGI, but the 2014 Olympic gold medallist has that look in his eyes this week and a team determined to follow him to another title. BRANDON, Man. – Scott McDonald and Team Ontario stole three single points for a critical 5-4 win over Stuart Thompson and Team Nova Scotia Tuesday to keep their hopes of advancing into the Championship Pool at the Tim Hortons Brier, presented by AGI, alive. BRANDON, Man. 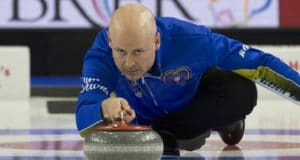 – Kevin Koe of Team Alberta (4-0, Calgary) executed a nearly-perfect angle raise takeout with last rock to score two in the tenth end and sneak past Brad Gushue and Team Canada (3-1, St. John’s, N.L.) 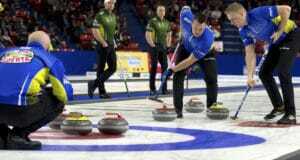 7-6 in a battle of heavyweights at the Tim Hortons Brier, presented by AGI, Monday evening. BRANDON, Man. – Martin Crête’s try for a double-takeout and victory turned into a steal and a costly loss at the Tim Hortons Brier, presented by AGI, Monday afternoon.